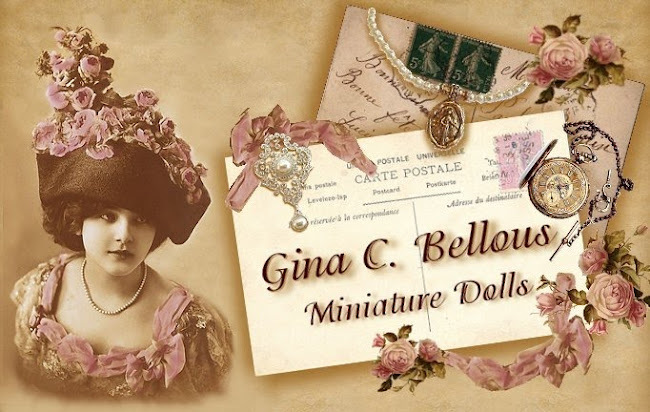 Gina C. Bellous Miniature Dolls: ♥ Portrait Sisters ♥ Collar, Cuffs & Fun Stuff! Now the costuming get to be a bit fun. 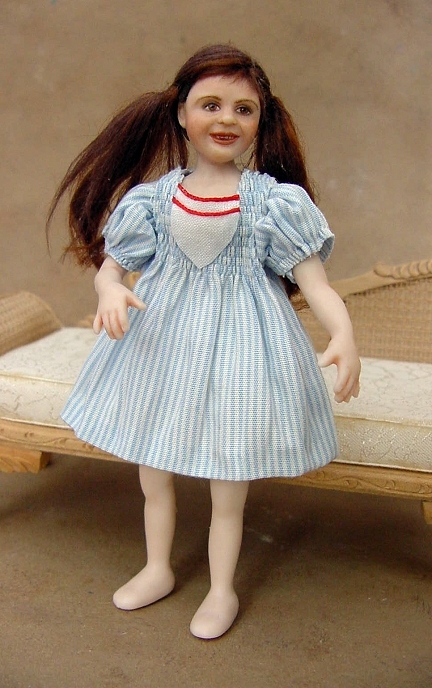 I love the small details as they add realism to the tiny dolls. I had to hand dye the silk cord trim & silk ribbon as I didn't have any in red. I also dyed some antique trim but as you can see in the photo, it came out a muted shade of red. It will be perfect for another project, but not this one. Following the directions for the fusible webbing, fuse 2 pieces of fine cotton batiste together. This will add rigidity to the fabric as well as keep it from fraying. Do not skip this step. Carefully cut around the pencil lines as smoothly as possible. Be sure to cut inside the lines so there won't be any pencil marks on the actual collar. Sharp scissors are a must! Here you can see the cut out collar. Notice the smooth clean edges and no pencil marks. Because the fabric has been fused together it will not fray. 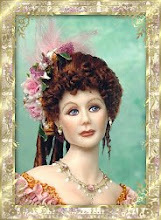 Super helpful in maintaining a clean and flat look that will add to the realism of this small scale. 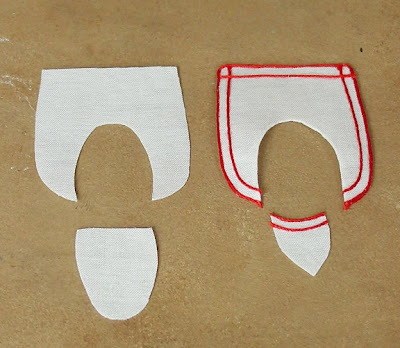 *DON"T throw away the piece that you cut from the center of the collar, it is perfect for making the inset yoke under the collar. Using the Tacky Glue and a needle tool, carefully apply a very thin bead of glue to the outside edge of the collar only! 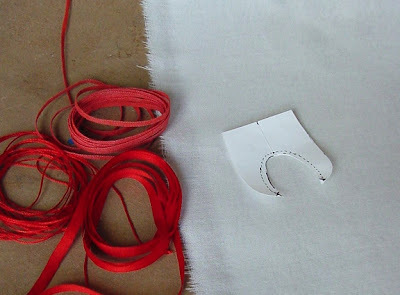 Slowly lay the red silk cording on the glue along the edge. Try to keep it as straight as possible. Repeat this on the edges for a second row of red trim trying to keep the cord equally spaced on all sides. Add 2 rows of red silk cording to the top of the yoke as well. When the collar is dry, you will want to turn the neck edge under so there are no raw seams visible. Now the magic really starts to happen! I love this part! Carefully glue the yoke to the open "V" area of the neckline. Notice how nicely the fusible webbing keeps the edges clean and from fraying. Ahhhh! Look at little Jocelyn now! She is really coming to life! 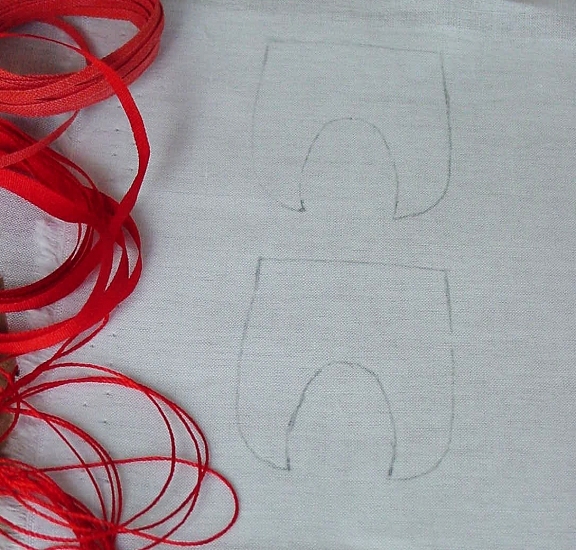 Red silk ribbon is tied in a tiny knot and added to the bottom of the collar in the front. You can see how neat and clean the collar is on the top side as well as underneath! 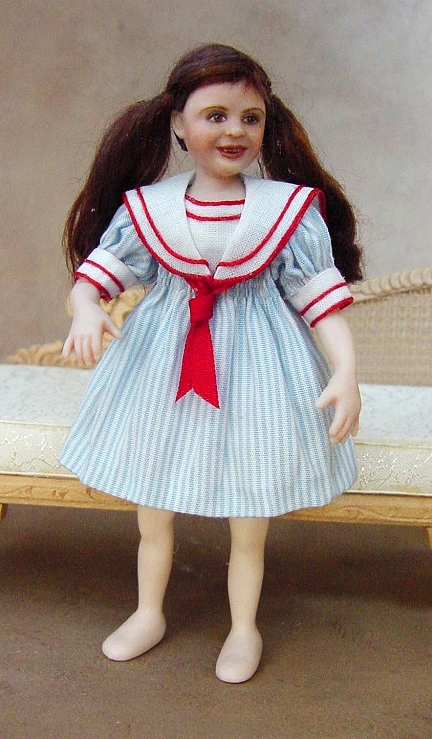 NEXT: The girls will get their socks & shoes and final hair styling & hair decorations and be off to their new home! I appreciate your willingness to share your techniques with us. They are wonderful! The dress came out so perfect! I love all of the details. Where did you find the silk cord? It is so perfectly small! Wow, wonderful works you have here! What an artist you are!